Over the past Competitive Play season, Overwatch players around the world have been hitting the competitive ladder, not only making their own skill-rating (SR) gains, but also gains for their countries to qualify for the 2018 Overwatch World Cup. The efforts of players in the top 150 from each nation—based on average SR—elevated 20 countries into contention. The four host countries—South Korea, USA, Thailand, and France—all automatically qualified for the tournament. With the qualification process now closed, you can visit the official site to see a complete list of countries that will compete and the group stages they will attend. China, which qualified with the highest average SR, was the top non-host qualifier, followed by Sweden and the United Kingdom. Congratulations to all the countries that qualified! Phase 1 of voting for each nation’s Competition Committee begins today (May 1). This phase runs through May 14. As we announced earlier, each country’s committee will be made up of three roles—General Manager (GM), Coach, and Community Lead—which will be decided in the following manner. 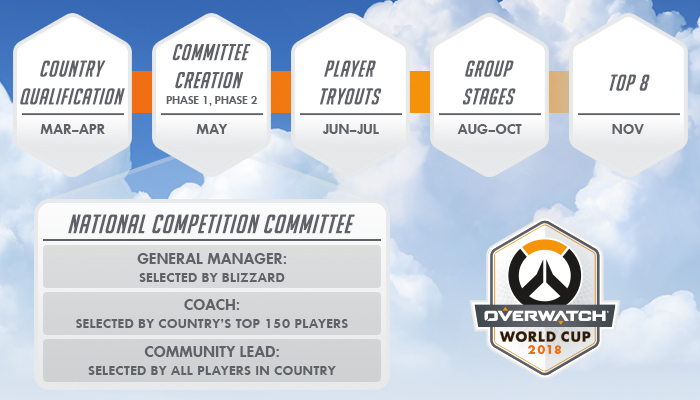 Coach and Community Lead: Starting May 1, you will be able to apply for either of these roles on the Overwatch World Cup site by logging in with your Blizzard Battle.net account and clicking the “Apply” button. Once you submit your application, you will be provided with a customized image and URL, which you can use to campaign for endorsements from your nation. All players from a qualified country may endorse as many candidates as they wish for both roles in Phase 1. GM: This role is not open to voting and will be chosen by Blizzard. Candidates will be contacted directly, but we also are accepting applications. If you think this role is for you, email [email protected] with your country in the subject line, and let us know why you think you’re qualified, along with your Battle.net email address and current resume. Phase 2 of voting commences May 17, when we will reveal the top three coach candidates and top 10 community lead candidates for each qualified nation for a second round of voting. All committee members are subject to approval by Blizzard. If you think you’d make a great General Manager, Coach, or Community Lead for your country, hit up the official Overwatch World Cup site, and be sure to follow @PlayOverwatch to stay up to date with the program!